A power of attorney "letter" is a legal document that is not typically in letter format. If you want someone to make decisions in your place, you sign a power of attorney document spelling out who you are naming and the authority you confer upon him or her. It is possible to put the document in letter form, as long as all other legal requirements are met. 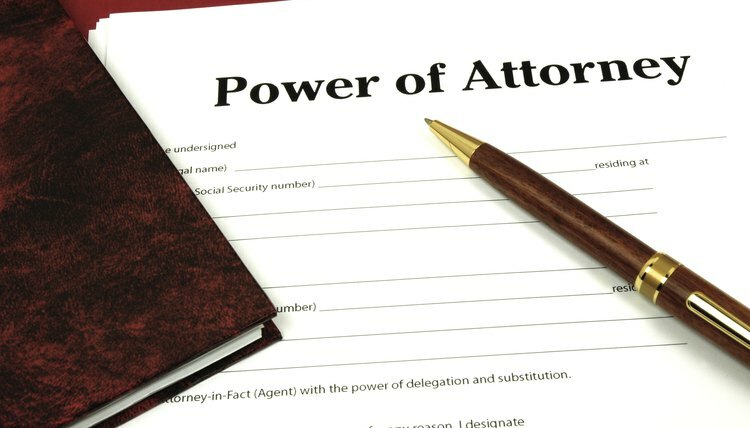 The purpose of a power of attorney is to give another person authority to act in your stead. The law does not mandate that the power of attorney be for any set length of time or that any particular breadth of authority be conferred. You are free to make a power of attorney that lasts for one day only or one that lasts indefinitely, until revoked. People often choose the former document when they have urgent financial business, such as closing a home sale, but will be out of the country when they need to sign the legal documents. Be sure to identify yourself, the person you are naming as your attorney and the scope and duration of power. The attorney can only do what you authorize him to do. Legal assistance is often invaluable in specifying the exact scope of the authority you wish to confer. If you decide to act without an attorney, you can create a power of attorney by using a form provided by your local court or state bar association. If you purchase one at an office supply store, check state requirements to be sure the form meets them. State requirements vary; many states require that you sign and date the document before witnesses and/or a notary; some, like Minnesota, require that the person appointed also sign the form. If you opt to create the power of attorney in letter format, simply enter "To whom it may concern" above the beginning of the form. Two common types of powers of attorney are financial and medical. If you give someone a financial power of attorney, she conducts business on your behalf. A general financial power of attorney confers authority to take any action with or regarding your finances that you could take yourself, for example, opening and managing bank accounts, taking our insurance policies and paying bills. Medical or health care powers of attorney give someone the authority to make decisions about your medical treatment on your behalf. For example, they can make decisions about the type of medication you take, which doctor you see and whether you undergo surgery. Both financial and medical powers of attorney can be limited in any way you specify in the document. A power of attorney generally terminates automatically if the person making the document becomes mentally incapacitated, which means they are not capable of making their own decisions. But a power of attorney that is labeled "durable" does not. Durable powers of attorney confer authority that continues in full force if you become incapacitated. For example, if you draw up a durable medical power of attorney, you give a trusted person authority to make medical decisions for you when you are no longer capable of making them yourself. You can revoke a power of attorney at any point while you are of sound mind; an incapacitated person cannot revoke a durable power of attorney. Spengler, Teo. "Power of Attorney Letter ." , https://legalbeagle.com/5577086-power-attorney-letter-examples.html. 18 March 2019.